Join us for our third annual exploration of the fascinating, obscure, and trivial minutiae of digital security, online rights, and Internet culture. It’s the ultimate technology quiz crafted by EFF experts and hosted by our very own Cybertiger Cooper Quintin. Many thanks to Facebook and Gandi.net for being our first 2019 sponsors! There's still time to sponsor EFF’s Third Annual Tech Trivia Night. If you or your company want to learn more, please contact Nicole Puller. 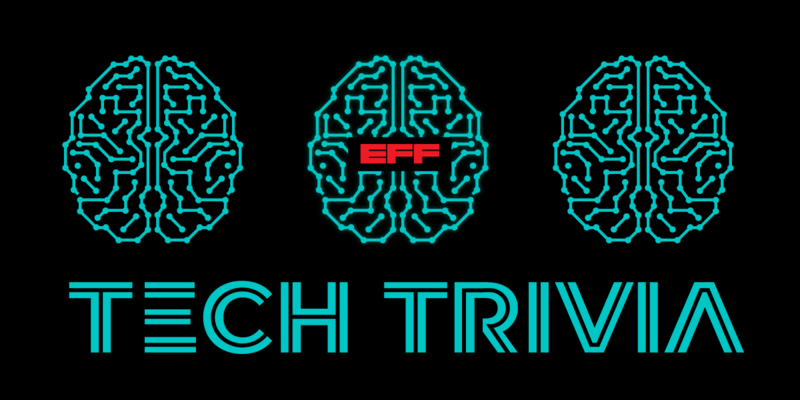 EFF is proud to welcome you to Tech Trivia! Check out our Event Expectations for information about how we address harassment.